Do you work with someone who has Fibromyalgia? Do you love someone who has fibromyalgia? Who do you know that has Fibromyalgia? Do you live near or are willing to travel to Columbus, Ohio to appear before the Ohio House of Representatives, Health and Aging Committee? 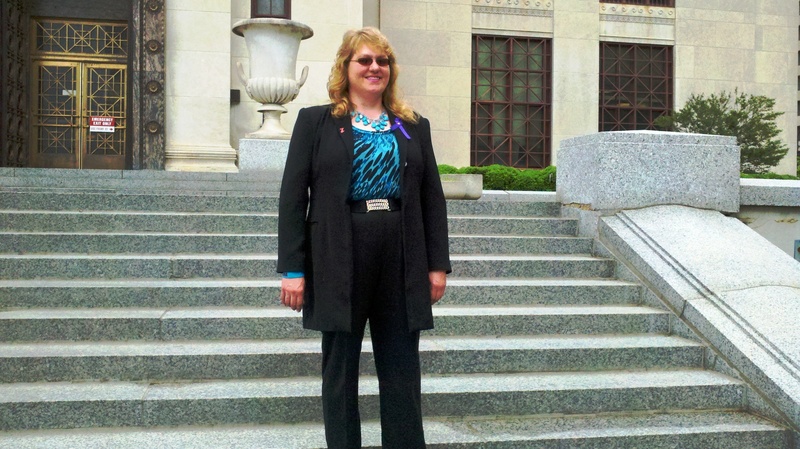 E. Michelle Lee, talk radio show host on Talktainmentradio.com and an advocate and sufferer of #Fibromyalgia reports that Ohio Senate CR23 has been scheduled for its first hearing in the Ohio House of Reps Health and Aging Committee, Wednesday, April 2, 2014 at 9:30am in ROOM: Statehouse 116. In anticipation of the upcoming Walk To Cure FM-OHio Ms. Lee hopes that all necessary hearings will be completed and ready for presentation at the Awards Ceremony to be held directly after the 1k/5K walk/run, being held at Wolfe Park in Columbus, Ohio on May 18th, 2014. For more details about the Signature Walk Selection by the NFMCPA “Walk To Cure FM-OHio” please visit the official Walk Page at http://www.PRWithAPurpose.com registration information online/in print can be found on the site (drop down menu) as well as sponsor/donation/fundraising information to help support the largest collective effort bringing awareness for those suffering in pain from the silent disease #FM. 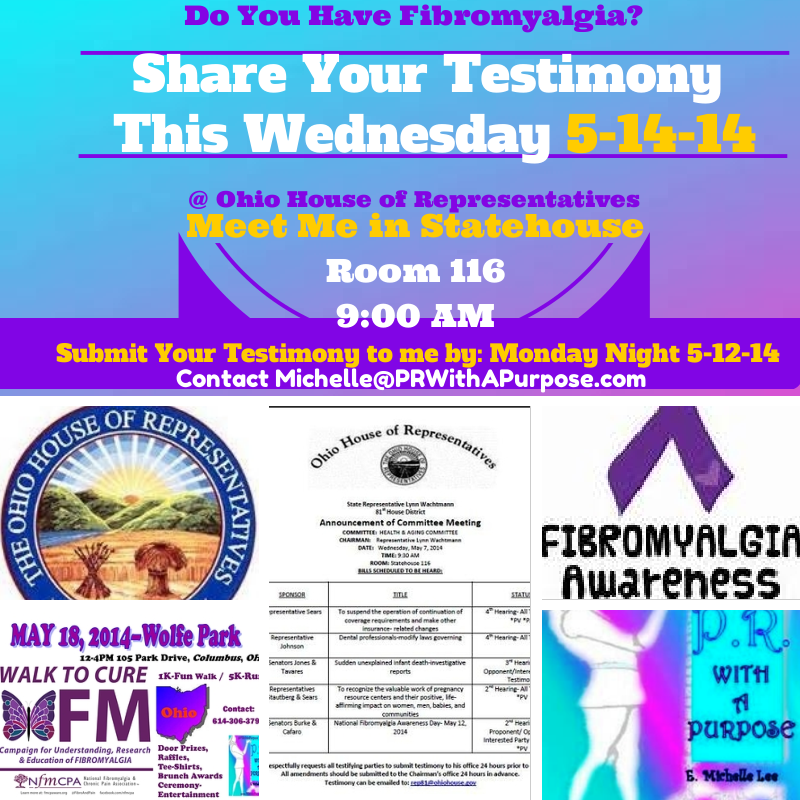 Please see the attached Committee Notice for more details on the legislative efforts on behalf of Fibromyalgia in Ohio. Please read the 3-17-14 Press Release for more details about the Walk To Cure FM-Ohio walk/run. Feel free to visit our You Tube Videos for some exciting news and encouragement “Silent Tears NO-more” Song release coming soon on iTunes. Walk To Cure FM-OHio gates open at 12PM with Ultrafit-USA racing company at the start line. Online Registration is now open and will be open through the day of the race; walk-ins are welcome for this Fibromyalgia Fundraiser. It will be a day of awareness filled with activities, education, inspiration, a walk, a run, brunch awards ceremony, celebrity entertainment, door prizes, raffles, tee-shirts, and more for FM Awareness 2014. 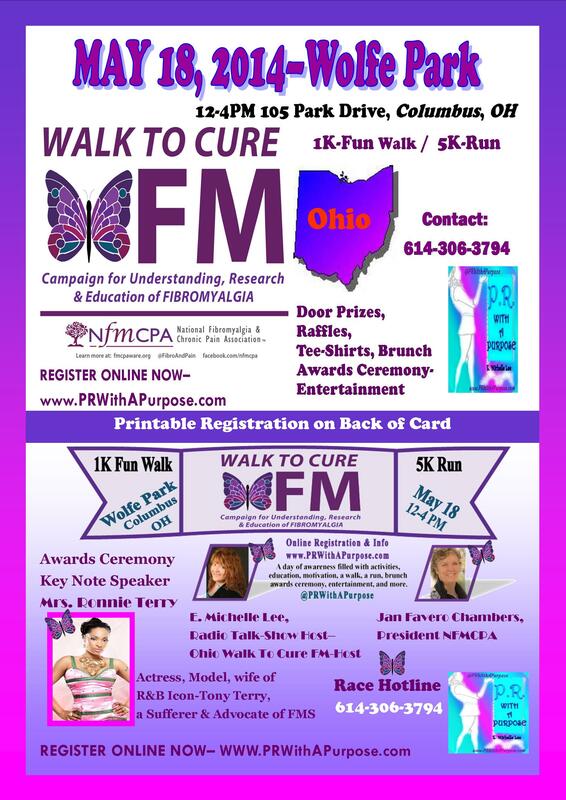 This event, was founded by the NFMCPA, it will kick-off with the local twist/theme Silent Tears NO-more created by E Michelle Lee, Host of the Ohio Walk/run, and a long time sufferer of fibromyalgia who will locally produce the event of the year for the FM Community nationwide. Noting that the theme title has now become a song title that will be performed by two celebrity artist to help raise funds for FM when its released on iTunes. Lee said that, “as the annual Walk To Cure FM-OHio grows she will be able to utilize more and more local vendors to widen the activities to serve men, women, and children as FM affects both genders and does not discriminate against age. Mrs. Ronnie Terry, wife of R&B Icon Tony Terry, a sufferer of fibromyalgia will be the keynote speaker and Columbus’s very own teen-talent Miss. Sydney Arterbridge, American Idol season 13 Hollywood Week Winner will be providing the entertainment. Jan Chambers, President & Founder of NFMCPA, will be traveling from out-of-state, as many other out-of-state volunteers, walkers, runners, and doctors specialized with FM and chronic pain, will be joining her to guest speak at the event and provide long overdue and much-needed education for all those who attend. Local Publicist E. Michelle Lee has set up a website for the #WalkToCureFMOH at www.PRWithAPurpose.com and a GoFundME.com account to help cover the cost of the race and with hopes to get donations for continued research and education for those who suffer daily with the silent beast, as she calls it; fibromyalgia. 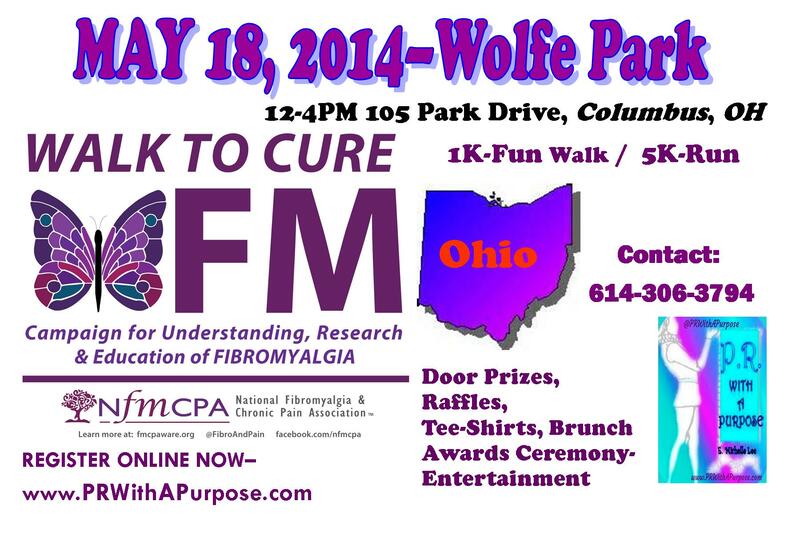 On May 18th, 2014 the National Fibromyalgia & Chronic Pain Association and E. Michelle Lee, local radio show host and sufferer of fibromyalgia will be hosting a 1k fun walk and 5k Run at Wolfe Park in Columbus, Ohio, in recognition of May 12th National Fibromyalgia Awareness Day 2014 as passed in the State of Ohio Senate (on to the House of Reps. now); to join in activities being held world-wide by various people and organizations to help bring education, hope, and encouragement to over 10 million people living with FM who are in PAIN. Please join us whether you can walk, run, or help in ANY kind of way. We have established an Event page for updates on FaceBook Page PR With A Purpose. PLEASE click on Events and join so we can keep you posted. Follow us on twitter @PRWithAPurpose or @FibroCoach4U. We thank you in advance for donating to this cause, which will take a lot of efforts with volunteers (20-30), walkers, runners, fees, awards, tee-shirts, and so much more that is needed in order to bring this together. We hope that with all our efforts to not only pay for the costs and bring awareness to this event as it is the 1st Annual Walk to Cure FM-Ohio but to also be able to donate some of the proceeds to the National Fibromyalgia & Chronic Pain Association to help them continue to educate and advocate for more research. We hope to encourage others to do activities in their local area so that collectively we help those who need help the most: pain sufferers with fibromyalgia. THANK YOU – stay tuned for updates.